Yes! Finally it’s hot and since I’m 100% Florentine this weekend I go to the coast. In addition this weekend take place the Blue Night from Livorno to Piombino. For all weekend there are guided tours, concerts and lots of events all along the Tyrrhenian coast, called from Livorno to Piombino the Etruscan Coast. I intend to be in Livorno on Saturday late morning, before 11 am because I’d like to take the tour of fossi by boat (fossi are the water canals built by the Medici to defend the city). 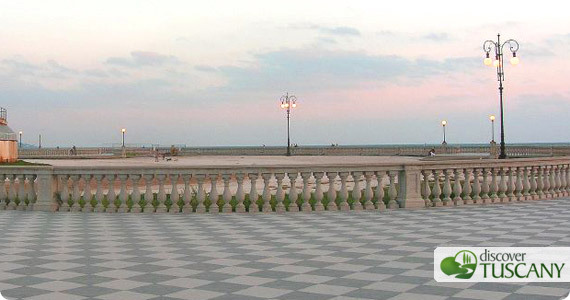 Next I have walk by the sea and take some picture to the stunning Mascagni Terrace. Of course I want to take some sun and turn red before dinner. Before dinner I want to visit the Giovanni Fattori Museum, who is one of my favorite Tuscan painter. Then I go near Castiglioncello to Caletta where there is the annual Festa del Pesce (Festival of Seafood). It’s a nice festival on the beach where you can taste good fried fish cooked in a huge frying-pan. The night ends with lovely and romantic fireworks. On Sunday I go to Castagneto Carducci and Bolgheri that are so beautiful. I like them because they have a fascinating medieval look but the flavor of saltiness. In Castagneto there the House-Museum of Italian Poet Giosuè Carducci, who described the spectacular cypresses of Bolgheri that need to be pictured! After lunch I head towards Florence and stop in Volterra where I want to visit the local Picture Gallery and Civic Museum displaying a remarkable Deposition by Pontormo, which stroked me the first time I saw it few years ago. So for this weekend in Tuscany I plan relax and good food along the coast.